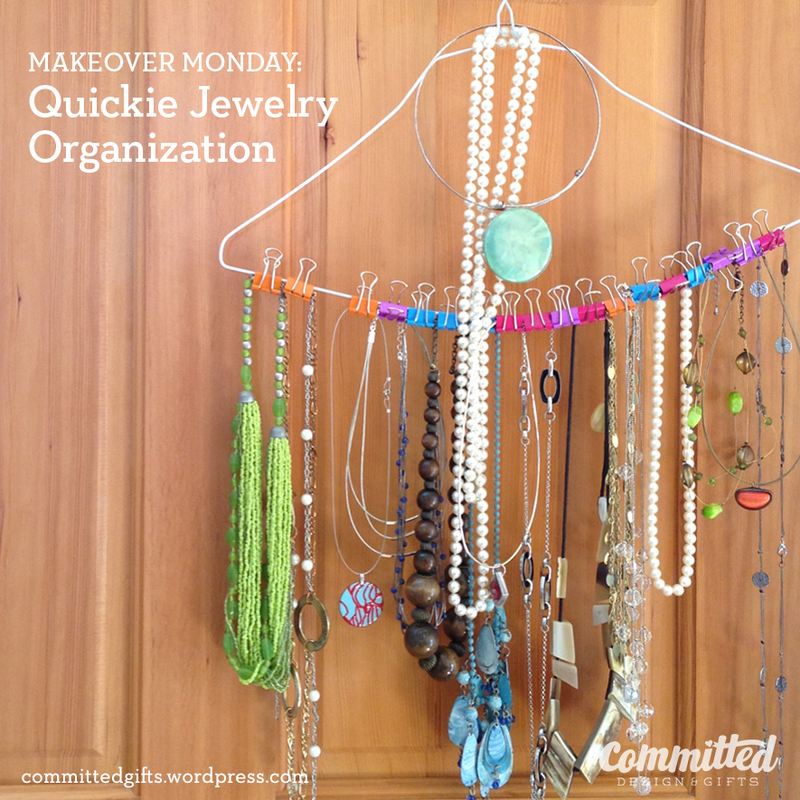 Makeover Monday: Cheap & Easy Jewelry Organization | Committed. It’s not ideal if your necklaces run heavy (I had a stone bead piece hanging in the middle, which made it bow), but for the little chain necklaces that are just dying to tangle up, this is great. Also, I’m not going to keep this hanging on the back of our door, because how annoying would that be? Clang! Bang! Every time you open the door…no thanks. It’s in our closet. 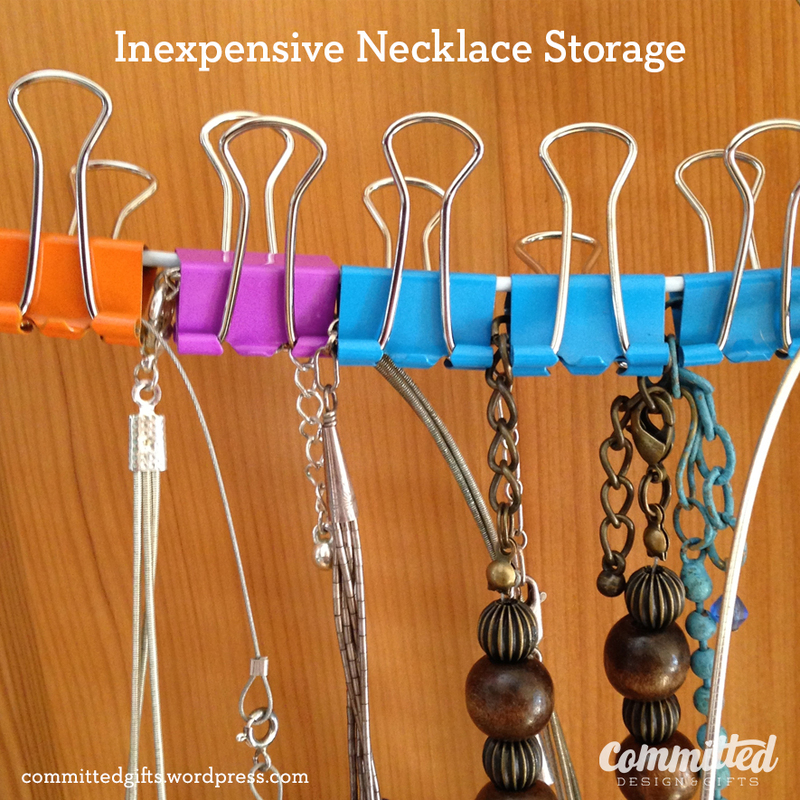 Close all your necklace clasps, clip individually along the hanger. Don’t clamp the necklace itself—close the clip around the chain. Tighten the “hook” part of the hanger so it doesn’t open up under the weight of your precious jewels. The longer strands or solid-shape necklaces can just go over top of the hanger. Hang! Done! 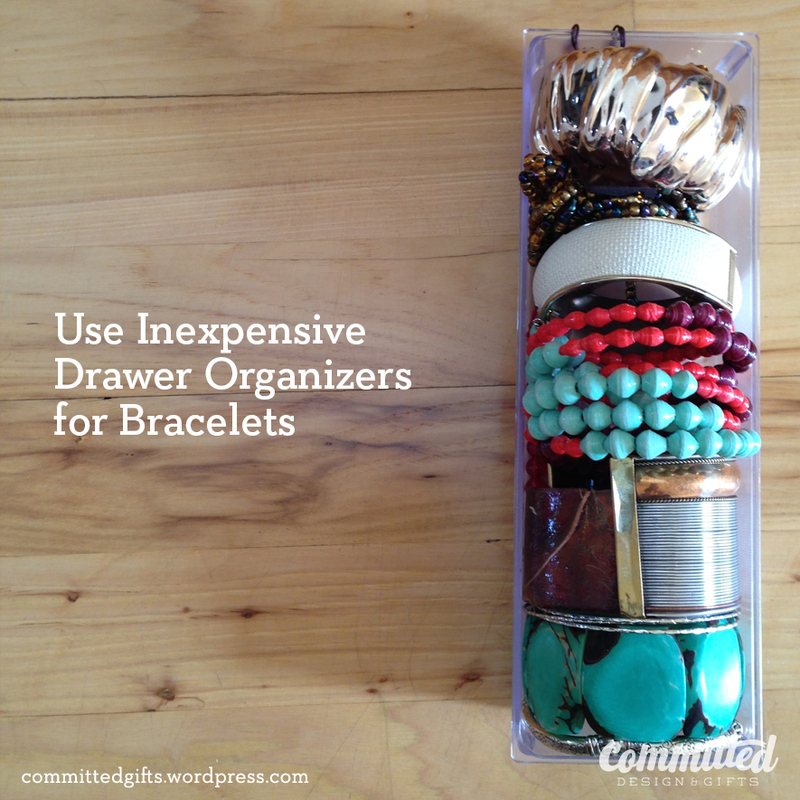 The other bit I needed to tackle was the bracelets. I had them all thrown in a drawer (with the necklaces), and I’d forgotten about a few I had. It’s no good if they never get worn! I was cleaning out the bathroom and linen closets, so I ended up with an extra plastic drawer organizer, originally intended for silverware. I think I picked it up at Target or Storables years ago. Anyway, it’s the perfect size for baubles. Better, right? Stash bracelets where your forks used to be! How has spring fever caught you? Are you working on any organization projects right now? I love your projects, and i love the inspiration photos, too. The colorful clips are such a cute idea! Thanks, Ricki Jill! I love your St. Patty’s Day post, especially those wreaths! Gorgeous! Thanks for dropping by!